Lipomas infrequently occur in the head and neck. Giant lipomas are defined by Sanchez et al. as lesions with size of at least 10 cm in one dimension or weighing a minimum of 1,000 g.  A large neck mass (>10 cm) with a rapid growth rate should raise concerns about a possible malignancy. The presentation with pressure sore is uncommon with a giant lipoma. Surgical excision of a lipoma is often used as the definitive treatment modality. In the present report, a 60-year-old man who presented with a giant neck lipoma with episodic bleeding and pressure ulcer is described. The 22 cm Χ 12 cm mass was successfully removed. The surgery produced excellent cosmetic results and no functional impairment. A 68-year-old male presented to our surgical outpatient department with a huge lump at the back of his neck for the last 11 years. There was an ulcer at the top of the lump for the last 9 months. Episodic bleeding was also reported from the ulcer for the last 6 months. On local examination of the neck, there was a 22 cm Χ 12 cm-sized swelling at the posterior side of the neck [Figure 1]. It was nontender and soft to firm in consistency. There was a 6 cm Χ 5.5 cm decubitus ulcer at the top of the lump. Dilated veins were present in the skin around the decubitus ulcer. There was no regional lymphadenopathy. Fine needle aspiration revealed mature lipocytes indicative of lipomatous lesion. Contrast Enhanced Computed Tomography Scan of the neck revealed a giant subcutaneous lipoma at the posterior triangle without septations. There was no communication with the spinal cord. After intubation with general anaesthesia, the patient was positioned in a prone position. An elliptical transverse incision of 12 cm was given at around the base of the lump. The superior and inferior skin flaps were raised [Figure 2]. Separation of lipoma from the surrounding tissues was easy and was performed with sharp and blunt dissections. Five to six large feeding vessels were also ligated to isolate the lipoma. The redundant skin was removed and the upper and lower skin flaps were stitched together with Silk-3-0 after securing haemostasis and placing a suction drain. The resected mass was 2.2 kg in weight and 22 cm Χ 12 cm in diameter [Figure 3]. The postoperative period was uneventful. The drain was removed after 3 days and the patient was discharged on the 9 th postoperative day. Histopathological analysis of the resected mass revealed mature, proliferative lipocytes with no cellular atypia, and it was diagnosed as benign giant lipoma. In conclusion, giant lipoma in the neck region is rare and complications like bleeding decubiitus ulcer and malignant transformation are important complications. Before surgery, CT or MRI neck is an essential imaging study. Early surgical intervention is a must for these giant lipomas. 2. Truhan AP, Garden JM, Caro WA, Roenigk HH Jr, Facial and scalp lipomas: Case reports and study of prevalence. J Dermatol Surg Oncol 1985;11:981-4. 6. Casani AP, Marchetti M, Dallan I, Cagno MC, Berretini S. Liposarcoma of the cervico-nuchal region. Otolaryngol Head Neck Surg 2005;133:1-3. 7. Yakubbu AA, Edino ST, Mohammed AZ, Shashe AA, Alhassan SU. 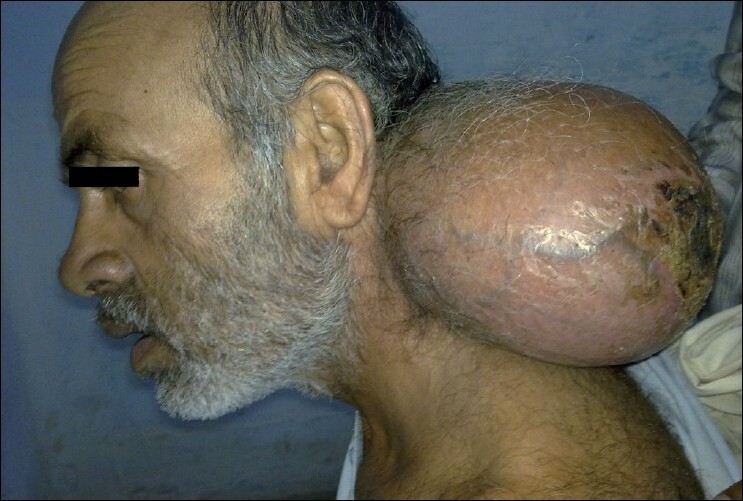 Giant and complicated subcutaneous lipoma of Neck. West Afr J Med 2008; 27:44-6. 9. Barisa AD, Pawar NH, Bakhshi GD, Yogesh S Puri,Aftab Shaikh,Narendra N Nikam. 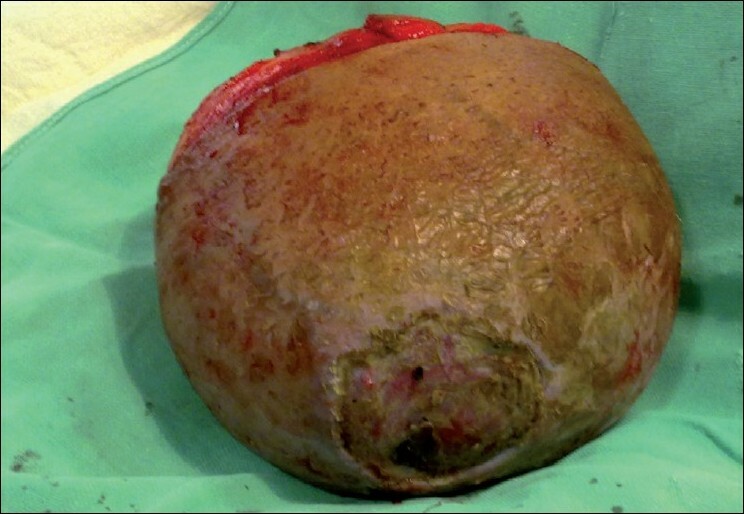 Giant Axillary Lipoma. Bombay Hosp J 2009; 51:91-3.